As one of the co-founders of Gitch Sportswear Inc and GSW Vitaly Lanochkin came to InView Marketing for some final design tweaks on his homepage and their custom ordering quote form. His company creates and supplies teams with hockey uniforms, custom hockey jersey’s, bags and awesome hoodies. 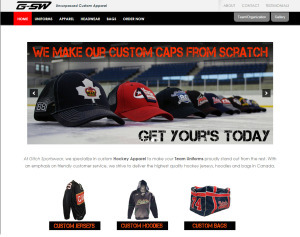 Located in Toronto and shipping Canada wide Getgitch.com is quickly becoming one of the leading companies for custom hockey apparel within the GTHL and other hockey associations here in Ontario. Another exciting factor about Vitaly is that his story was chosen by Molson Canadian in their “Anything For Hockey” Campaign. This was a huge opportunity for him to thank his father and enjoy a special moment with him that they both will remember for ever.